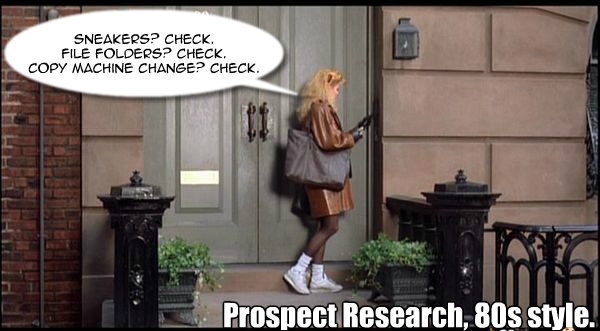 These days, prospect research is seen as a fairly cerebral task where you sit at your desk gathering information using a computer while trying not to snack (or maybe that’s just me?). Those days may be gone (or maybe not! ), but it’s not as if the resources at the library stopped being relevant. Many of them evolved to become e-resources – online, but only available for free to patrons within the library’s four walls. And still great for prospect identification. In honor of Library Card Sign-Up Month, let me be the first to encourage you to stretch up out of your chair, lace up your sneakers and get thee to a library! In half the time of the typical Prospect Review Meeting, you will delight at the bounty of free research resources available to you for prospecting. For example, my local library has an extensive list of online sources with a host of biographical, genealogical, and financial information. Even better, access to the Watertown online catalog provides entrée to even more resources (both solid and virtual, domestic and international) via the Minuteman and (be still my heart) the Boston Public Library networks, including the world-class Kirstein Business Library. Other choices include downloading whole magazines like ArtNews (which highlights collectors), Bloomberg BusinessWeek (business types) and Town & Country (the horsey set). Some titles even have archives! For smaller organizations, specialty libraries like Associated Grant Makers and the Foundation Center’s five locations are a real godsend. Besides providing the very best resources available, reference librarians at these locations can help guide you in identifying new potential funders. Some colleges and universities also offer electronic access to their library resources for alumni, so that’s worth checking out, too (and another good reason to slip in a few extra dollars in support of your college library’s annual fund efforts). What does your local library offer to in-building patrons? While it’s still nice outside, now’s a great time to find out! Your feet were made for walking.